A striking 14kt yellow gold ring, with 3 claw-set round brilliant cut diamonds, est. 0.53ct. 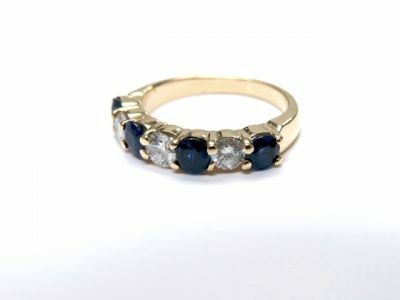 (clarity:SI-I1 & I-J colour) and 4 claw-set round facetted cut dark blue sapphires, est. 1.43ct.